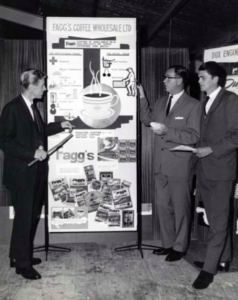 John Calvin, wearing glasses, with two government trade representatives at a trade show in 1966. John Calvin, more than anyone else, built an industry to allow a cup of coffee to become part of everyday life in New Zealand. 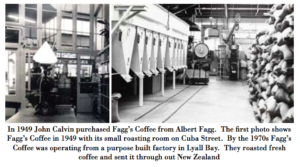 The first photo shows Fagg’s Coffee in 1949 with its small roasting room on Cuba Street. 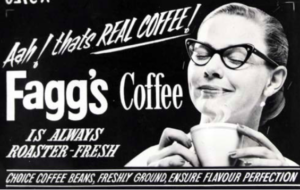 By the 1970s Fagg’s Coffee was operating from a purpose built factory in Lyall Bay. They roasted fresh coffee and sent it throughout New Zealand. 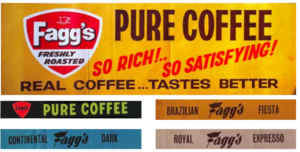 In 1949, when John Calvin purchased Fagg’s Coffee from Albert Fagg, the freshness of the roast and the finesse of the blend was not something consumers knew about. Coffee at the time came with condiments, mostly chicory. Casual dining in New Zealand meant tea-rooms, milk-bars, fish & chips. Also, coffee hospitality such as coffee houses, coffee bars, coffee lounges and so on was an option for casual diners. 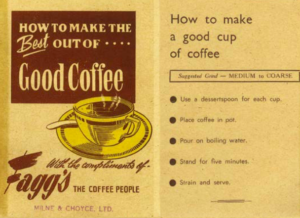 Some coffee houses especially in Wellington were highly fashionable and set a new standard, often with their signature blend developed with Fagg’s Coffee. John Calvin travelled offering coffee tastings at department stores and grocery shops. He encouraged people to appreciate the taste of freshly roasted coffee. In 1952 John Calvin travelled to Papua New Guinea. He became the first person to import their green beans directly into New Zealand. Papua New Guinea premium mild Arabica coffee. Still an important part of the New Zealand coffee taste. He dealt directly with growers’ co-operatives in Papua New Guinea and Kenya. Thanks to John Calvin, by the 1970’s most coffee consumers had access to freshly roasted coffee. “Fagg’s vacuum packed” was available at their local ‘Four Square’ store. John also sourced his green beans from places such as Colombia, Jamaica, Costa Rican, Java and Brazil through Harrison and Crossfield in England. 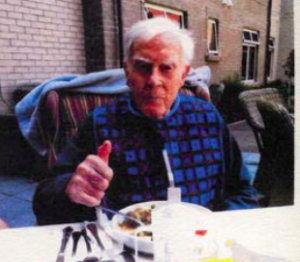 John passed away in July 2018 reaching the incredible age of 101.5 years. We believe his longevity and pioneering nature should be directly contributed to all the coffee he drank and sourced.